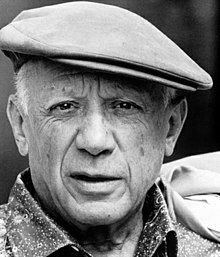 Pablo Picasso (October 25, 1881 – April 8, 1973) was a Spanish artist. "For a long time I limited myself to one colour — as a form of discipline." Simple: For a long time I used only one main colour when I painted, to train myself. "It means nothing to me. I have no opinion about it, and I don't care." Simple: I don't care or have any thought about it. "People who try to explain pictures are usually barking up the wrong tree." "Painting isn't an aesthetic operation; it's a form of magic designed as mediator between this strange hostile world and us." Simple: All children are artists. The problem is how to stay an artist when the child grows up. What it means: When you grow up, you lose the creativity you had when you were a child. ↑ Quoted in Peter's Quotations: Ideas for Our Time. Laurence J. Peter. Bantam Books, New York NY, USA. 1977/1979. Page 25. This page was last edited on 26 October 2009, at 22:05.